Options Trading A Step By Step Strategies Guide On How To Excel At Options Trading Has Finally Arrived!Strategies on How to Excel at Options Trading When it comes to having a little wiggle room in the stock market, options trading can’t be beaten. The simple ability to choose whether or not you want to purchase the underlying stock attached to your options can easily lead to success in scenarios that would only lead to failure in the stock market. With that being said, however, in order to maximize your options trading experience, you need to be able to rely on successful strategies you can count on when the going gets tough. If you are looking to take your options trading game to the next level, then Options Trading: Strategies on How to Excel at Options Trading is the book that you have been waiting for.Inside you will find over a dozen different strategies that can be used regardless of the market conditions or if you are selling or buying, and often both at once. You will find strategies that cover multiple types of spreads, notes for trading indices, the weekly options market, how to minimize an existing bad trade via the stock repair strategy and more.Without a doubt, this book contains everything you need in order to stop questioning potential trades and start acting in a manner that will ensure you maximize your profits with every trade. After all, time is always of the essence when it comes to making the best trades and Options Trading: Strategies on How to Excel at Options Trading will get you to the place you need to be to stop second-guessing and start succeeding. No matter what level of risk you prefer or how long you have been in the options market, you will find something useful inside.So, what are you waiting for? The options market is all about choice and now is the time to choose to stop wasting time on trades that do little more than break even. Take control of your trade experience and buy this book today!Inside you will find:	The best time to utilize the index straddle and why you may want to consider options trading in the indices in general. The best way to break even on stocks that have already dropped out of the money. Spreads, spreads and more spreads. Nearly ten different spread strategies to ensure you have the right spread for every occasion. The top technical indicators for the options market that you likely aren’t already using. The complete details on the little-known options trading market that is perfect for short term trades. All about combination strategies and why you need to start using them right now. 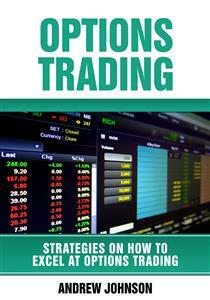 And more…This is the only strategies guide on options trading you will ever need! When it comes to having a little wiggle room in the stock market, options trading can’t be beaten. The simple ability to choose whether or not you want to purchase the underlying stock attached to your options can easily lead to success in scenarios that would only lead to failure in the stock market. With that being said, however, in order to maximize your options trading experience, you need to be able to rely on successful strategies you can count on when the going gets tough. If you are looking to take your options trading game to the next level, then Options Trading: Strategies on How to Excel at Options Trading is the book that you have been waiting for. Inside you will find over a dozen different strategies that can be used regardless of the market conditions or if you are selling or buying, and often both at once. You will find strategies that cover multiple types of spreads, notes for trading indices, the weekly options market, how to minimize an existing bad trade via the stock repair strategy and more. Without a doubt, this book contains everything you need in order to stop questioning potential trades and start acting in a manner that will ensure you maximize your profits with every trade. After all, time is always of the essence when it comes to making the best trades and Options Trading: Strategies on How to Excel at Options Trading will get you to the place you need to be to stop second-guessing and start succeeding. No matter what level of risk you prefer or how long you have been in the options market, you will find something useful inside. So, what are you waiting for? The options market is all about choice and now is the time to choose to stop wasting time on trades that do little more than break even. Take control of your trade experience and buy this book today! The best time to utilize the index straddle and why you may want to consider options trading in the indices in general. The best way to break even on stocks that have already dropped out of the money. Spreads, spreads and more spreads. Nearly ten different spread strategies to ensure you have the right spread for every occasion. The top technical indicators for the options market that you likely aren’t already using. The complete details on the little-known options trading market that is perfect for short term trades. All about combination strategies and why you need to start using them right now. Congratulations on downloading Options Trading: Strategies on How to Excel at Options Trading and thank you for doing so. When it comes to having a little wiggle room in the stock market, options trading can’t be beaten. The simple ability to choose whether or not you want to purchase the underlying stock attached to your options can easily lead to success in scenarios that would only lead to failure in the stock market. With that being said, however, in order to maximize your options trading experience, you need to be able to rely on successful strategies you can count on when the going gets tough. To that end, the following chapters will discuss a wide variety of different options trading strategies designed to ensure that your time spent trading options is as fruitful and painless as possible. First, you will learn all about long and short combinations as well as when the best time to use each really is. Next, you will learn how to put straddles to use in the index market as well as the benefits of trading options in the index market in general. From there you will learn how to minimize the impact of a bad stock trade via the stock repair strategy. Then you will learn how to use both vertical and horizontal spread strategies before learning all the details of ratio and front spread strategies as well. The talk of spread strategies then wraps up with a detailed discussion of both put and call backspread strategies. Up next you will learn about many of the technical indicators that work best with options trading and why you will always want to use multiple indicators no matter what. Finally, things will wrap up with a discussion of the pros and cons of weekly options trading and why it may be the right choice for you.